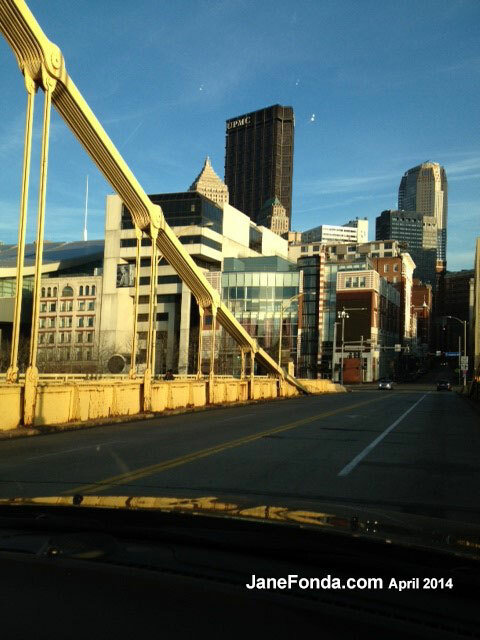 I’ve been in Pittsburgh this week working on a film called “Fathers & Daughters” with Russell Crowe. It’s an intense, moving story about a Pulitzer Prize winning author (Russell) who suffers from depression and is trying to raise his five-year-old daughter (whom he adores) alone because his wife was killed in a car accident. His sister-in-law (Diane Kruger) is trying to forcibly adopt the daughter because she feels he isn’t a fit father and she blames him for the accident that killed her sister. The young daughter is played by 10-year-old Kylie Rogers. Amanda Seyfried plays the daughter 25 years later, after her father has died, as she struggles to heal from the trauma of her childhood. My friend, Quvenzhané Wallis (“Beasts of the Southern Wild”) is also in the film as is Octavia Spencer (“The Help”). All my scenes take place in 1989 so, unfortunately, I didn’t get a chance to see or work with any of them. The photo above was taken on my first day working with Russell. I play his friend and literary agent. I didn’t know what to expect and was excited and nervous. Was he going to be standoffish? Moody? Hard to work with? I needn’t have worried. First of all, he moved me to tears on a number of occasions during our scenes together. In our first scene, I’ve come to pick him up from a mental institution (above) where he’s spent the past year. He has a long walk down the sloping path to where I’m waiting and watching him as he approaches, his body language, the way he was all scooped out and sunken in on himself was astonishing– the way he found to embody a man just released from such a place after 12 months. Yet, in between takes, he was friendly, present and smart. OMG the man is smart and thoughtful. I had no idea. I guess I should have, because how do you wrap yourself around roles like the ones he played in “The Gladiator, “A Beautiful Mind” or, more recently, “Noah”, without a depth of intelligence? Watching Russell work these last days I was able to see up close that his gift is epic. He can be so subtle and at the same time, isn’t afraid of getting big. One minute he would be talking to me with a little boy’s charm and adorability and the next he’d have slipped to the depths of intensity and pain of his character. We talked about a lot of things including my niece, Bridget, and my brother, both of whom he’s worked with. 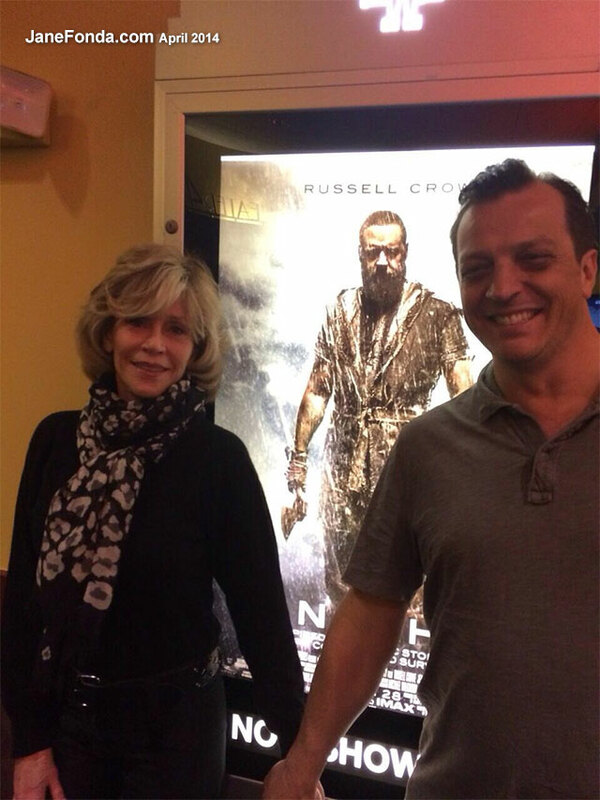 Last Monday night, I went to see “Noah” with our director, Gabriele Muccino, his wife Angelica and two of our producers, Craig Flores and Sheryl Clark. I liked the film very much because it is so relevant today. Two opposing paradigms, the very same ones that are doing battle right now over the future of the planet, are starkly dramatized: One represents the belief that humankind has the right to plunder and destroy God’s creation for our own uses; that we are entitled to have “dominion over” all other sensate beings, animals and growing things. The other belief system, the one represented by Noah, holds that humankind has made a mess of things and that, if we are not stopped, the planet (God’s creation, after all) will be destroyed. I can think of no more important message to depict in a major film than this one and holding it all together in a way that makes the film work, is Russell. It’s a monumental responsibility and he fills it heroically. There’s a lot of parts to Russell: Besides being an actor, he is a director and owns a rugby team in Sydney Australia. It’s the team he grew up rooting for, the team that helped form him as a kid and he bought it when it wasn’t doing well because he felt it was important for the community, for young people like he was, to have a team worth rooting for. And talk about multi-tasking, he’s been traveling the world promoting “Noah,” editing an epic film he just finished directing, while creating the complex character he plays in “Fathers & Daughters.” Impressive. I hope that I’ll get a chance one day to work with him again. Our Italian director, Gabriele Muccino, is impressive, too. He’s made “The Pursuit of Happyness” and “Seven Pounds” with Will Smith, among others films. Because I was coming into Pittsburgh, working for 4 days and then leaving, he did something surprising and lovely: he wrote a long letter giving me the whole back story of my character’s relationship with Russell’s character in the most generous, loving, touching words. On the set I found him very helpful and observant, always steering the scene where it needed to go emotionally. 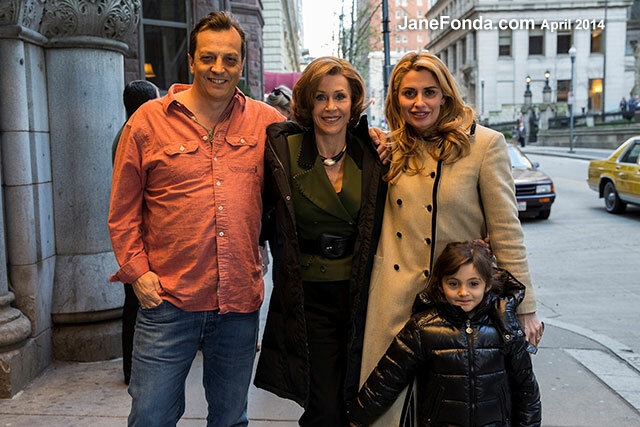 Here’s a picture of him with me before a scene where I accept a Pulitzer Prize posthumously for my client (Russell).
. . . and Gabriele and his wife, Angelica and their daughter, Penelope. Then there’s Pittsburgh. I’ve been there before–in the 1970’s during the Vietnam War because there was a strong peace movement there and again in the 90s with Ted Turner when the Braves were playing the Pirates during the World Series. 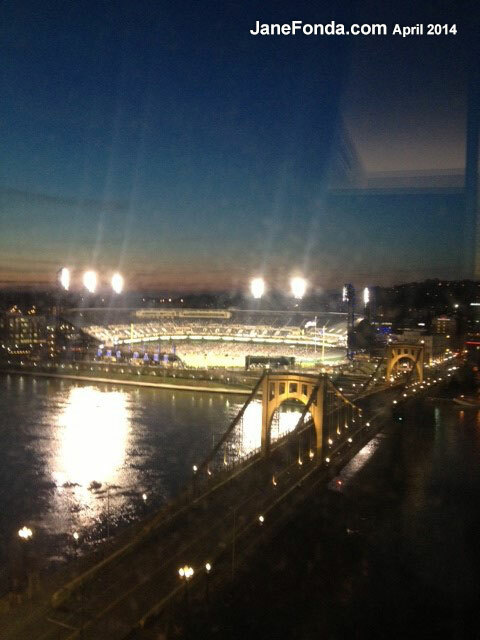 Here’s a view of the field that I took from my hotel window during a game the other night. (The Pirates won). I thought back on that time with Ted. I must have been 53 or 54 years old and no longer an actor. If anyone had told me then that I’d be back in Pittsburgh at age 76 filming with Russell Crowe I would have pronounced them out of their mind. Everyone on the film seems to love Pittsburgh (and many of the crew are Pittsburgians). I can see why. It has so much personality. It’s a relatively small city with a whole lot of history surrounded by hills that are part of the Allegheny Mountain range. Stand on many of the streets in the city and you can see where the street ends with a river and on the other side of the river are hills covered with forests. Within 10 minutes from the center of the city I saw deer everywhere. And there are bridges everywhere—446 of them. View from the car crossing a bridge. 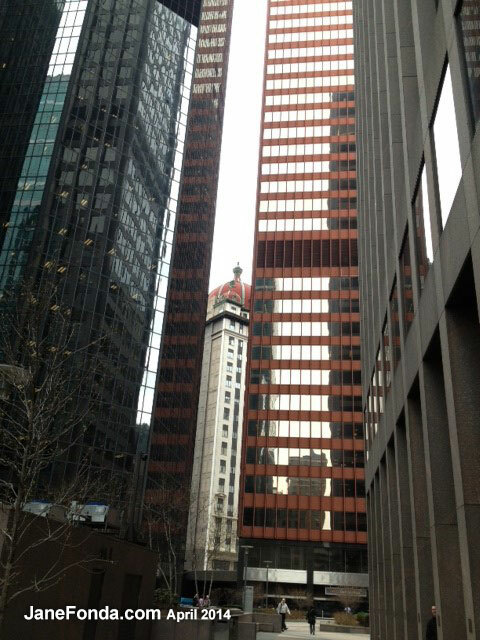 Pittsburgh is playing New York in the film. Here’s a view from my character’s office window. Monday night after seeing “Noah” we all went to a wonderful restaurant called Meat & Potatoes. 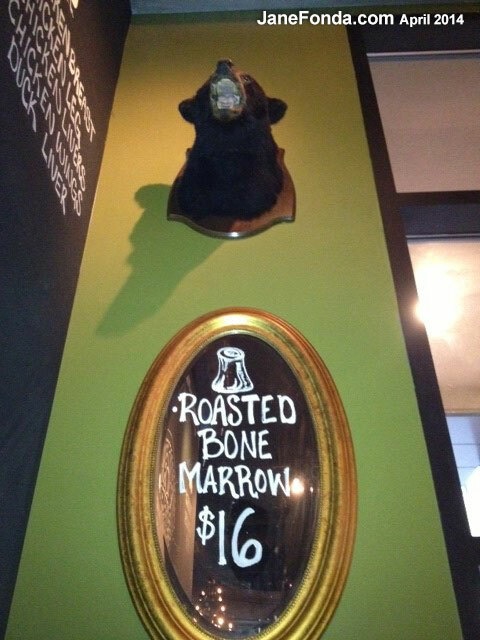 This bear’s head was hanging over us with the menu item for bone marrow. I adore roasted bone marrow but not when I’m filming. Too rich. The bartender in the restaurant told us about a potato vodka made in Pittsburgh that, according to him, has been voted the best vodka in the U.S. I had plenty that night and I think he’s probably right. I’m having a case shipped to L.A. It’s called Boyd and Blair Potato Vodka. The web site is boydandblair.com in case you want to check it out. 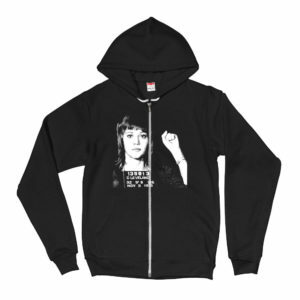 And here’s the link to the article in case you want to order one as I’m planning on doing: http://m.huffpost.com/us/entry/5133580?utm_hp_ref=tw Trust me, it is beyond good. According to the article, Bon Appetit named Pittsburgh the best new food city of 2014. One more thing. I want to give a shout out to Starbucks. It’s like CNN International–when you’re away from home, you always know you can get good stuff there. I’m writing about this because my website friends seem to be interested in what I eat. Every morning (Except Wednesday when I had to get up at 4am and be ready to go at 5am–Starbucks opens at 5:30) I walked 3 minutes from the hotel, got the New York Times, a double expresso, a bottle of coconut & pineapple water, and oatmeal with nuts and brown sugar. And on my day off, I also got a slow-roasted Ham & Swiss sandwich on that amazing wheat bread they use. Yum. I’d sit for an hour, wake up, read the paper from cover to cover, and eat that delicious oatmeal and never had to feel guilty. Thank you Starbucks. I checked out the cast of this film: Janet McTeer, Quvenzhané Wallis, Diane Kruger, Aaron Paul, the wonderful Octavia Spencer, Bruce Greenwood and above all, you? Count me in. I have yet to fall under the charms of Russell Crowe and Amanda Seyfried but you alone make a movie a must-see for me. Since I’m not a particularly huge fan of any of the actors of Noah (although I do love Darren Aronofsky, the director), I didn’t plan on watching, but you certainly caused me to doubt. Anyway, I’m still catching up on some of your early movies (once you said David O. Russell knows like every movie you made, I feel like challenging this great director who should totally work with you) – I just got Any Wednesday (I so love these 1960s comedies) and I’m going to order Walk on the Wild Side on amazon. I’m not sure if you have scenes with Barbara Stanwyck in it, but alone the fact that my two favorite actresses star in the same movie blows my mind. Stanwyck was such a pro, such a force, I’m totally fascinated by her. She blows your mind away so much that one even forgets to be jealous of her talent and presence. I remember once I asked you about her and I was glad to see all that positive feedback about her. Interestingly, you hosted her AFI life achievement awards ceremony, which I watched. Amazing. It’s as if Jennifer Lawrence (my new huge favorite whose talent and presence I think one day will measure up to yours and Stanwyck’s) was hosting your tribute that’s coming up (I’m so excited, I guess you’re even more 😉 ). DANIEL, I SHARE YOUR ENTHUSIASM FOR JENNIFER LAWRENCE. BUT TRUST ME, RUSSEL IS A DEEP TALENT. It boggles my mind at how overrated Jennifer Lawrence is. To compare her to Jane and Barbara is madness! Jem, I believe you are very wrong. Jennifer Lawrence is the real deal. A deep talent and good person. She will be with us in a major way for a very long time. I’ll betcha anything. No flash in the pan she! I’m glad you enjoyed working with our Aussie Film Star Russell Crowe…I loved his work in Beautiful Mind, and I’m looking forward to seeing you and this interesting film…your a very busy woman, but a very happy busy woman. : D I enjoyed reading this article too! Russell is really a great actor! I loved Noach. I’m sure that I will have a wonderful time seeing you both working together. Wishing you all the best, Ana Laura from Brasil. 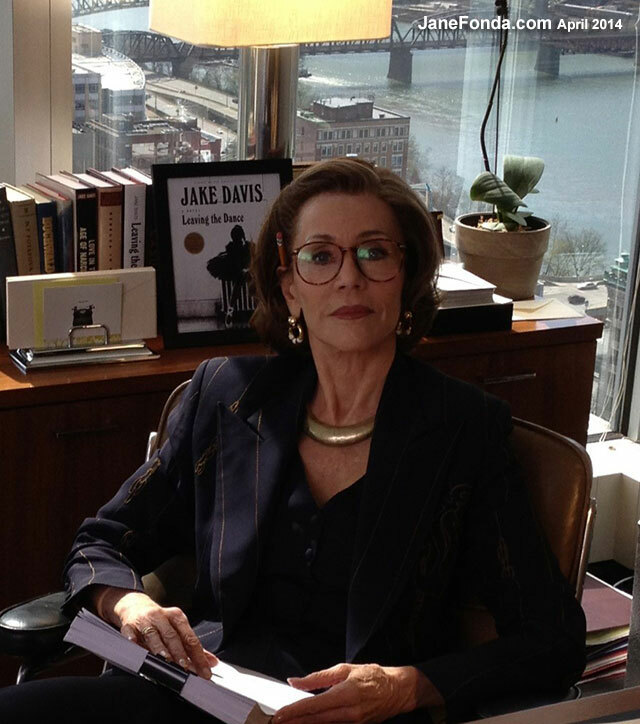 Hi Jane,enjoyed the article on the movie and Pittsburgh.I was an extra in 2 scenes with you;the cemetery (behind you), and the Pulitzer dinner.Great fun! Everyone thought you were very nice and down to earth .I’m dating myself but one of the first movies I saw as a child was “Cat Ballou” and I’ve been following your career ever since.It was kind of surreal being being in a scene with you all these years later. Looking forward to seeing this movie….I think I caught a glimpse of filming when the roads were blocked off…. 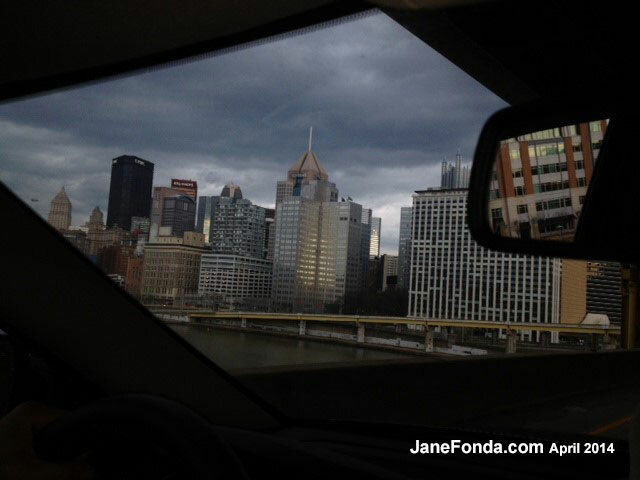 Jane…you look FANTASTIC….and thank you for this beautiful post about Pittsburgh. We are so proud of our city and glad you are enjoying your stay here!! Enjoy reading your blog …thanks for sharing your adventures and your thoughts!! Its going to be a great film, i´m sure it will pump! About the photos, you look Great ! Now,we are shooting a 52 min.documentary about the beautifull Guanabara Bay, in Rio de Janeiro, wich is extremely polluted and agonizing for survival! We are trying to wake up the people so we still have a chance to recover it! .. and we are going to have the world cup here! Bess regards, God Bless you! It was nice talking to you on the set of “Fathers and Daughters”. You were right, it was getting cold. I ended up wearing the jacket that I was holding in the next scene. I’m glad that you like our beautiful city and I’m glad that you are having a great time working with Russell Crowe. Although I didn’t meet him, he sounds like a nice guy from what I read in your article. Hope to talk to you again if/when you visit Pittsburgh again. 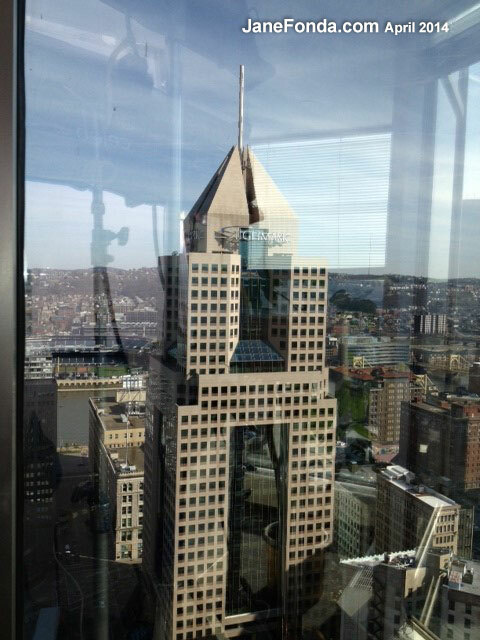 Thanks for sharing your experience in Pittsburgh, Jane! My husband is from there and we try to get up there as often as possible to visit his uncles and cousins. I’m looking forward to seeing the film. The last time we were in Pittsburgh was last August for our fantasy football draft. Let me just tell you, being in a fantasy football league with a bunch of Steeler fans (myself included) can almost be classified as a religious experience! 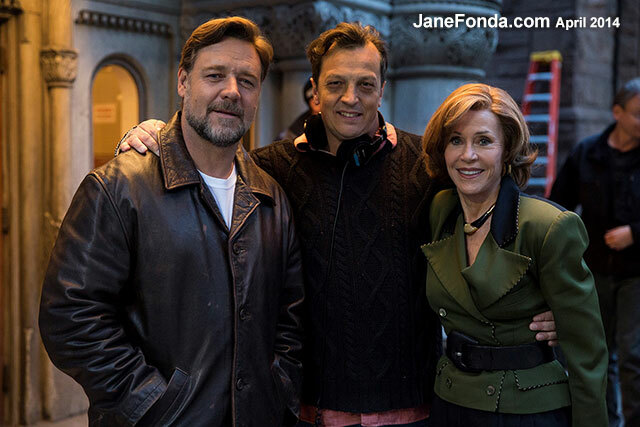 I am glad to hear that Janet McTeer is in the film. I met her in the mid 90s when we were living in NYC (doing that acting thing…hey, I had to try). One of my friends was a production assistant working on her production of A Doll’s House (Didn’t you play Nora, too? In a film version? I could swear I’ve seen that.). She won the Tony that year along with her co-star and I think a few other people on the show as well. Excellent production…I saw it three times. We used to hang out with the cast after shows at the restaurant next door to the theater (Cafe Un Deux Trois) and, let me tell you, those Brits sure know how to have a good time! I remember two things about her (other than her wonderful acting, that is). 1) She is very tall, and 2) She loved Goldschlager. In fact, I think that was the first time I had ever had Goldschlager…and it was good. Melissa, YES!!! I forgot to mention that the amazing Janet McTeer is also in the film. I saw her in (was it called?) “Mary & Elizabeth,” about the queens. From then on I called her “My Queen.” We were both nominated for Tony Awards that year and that’s how we got to meet. Truly awesome. Was the name of that play “Mary Stuart?” Another play she did in the West End then transferred to B-way a few years later? I think I read something about that or saw it on the Tony Awards that year. Anyway, I recently found a nice surprise on Netflix…the film you did in France a few years ago, “All Together.” I really enjoyed that! I love surfing Netflix and finding gems. And I can’t wait to see your new show with Lily Tomlin! But, I shouldn’t start talking about that because then I’d have to start talking about “9 to 5” and I’d be on here all day (one of my absolute favorite films of all time). Thanks for the reply…Rock on! Melissa, I like your “rock on.” I often sign my letters “onward!” but just got an email from David O Russell who signed “semper avanti” which I like too. Always liked Latin. Does that make me an uppity elite? Thanks for this love letter to Pittsburgh! It’s such an amazing town (I grew up just outside in a little place about 30 minutes away). Please come back and explore more. I am happy to see this being done. Mr Crowe has been one of my favorite actors since watching him in the move “Insider” He becomes someone else and does it with such ease. This is a fantastic cast and will be excited to see you all in it. Great Post. Have a great day. Very nice blog, thank you. The pictures are beautifull. And it is cute to read that you felt nervous about meeting and acting with Russell Crowe:-) because you are one of the most gifted actresses yourself. I can just imagine that he felt the same about meeting you, at least I would be…. And you really look amazing. How on earth is it possible that you stay so young and are able to do all that you do. Well you gave some tips and tricks in Primetime which I gave to a Belgium friend of mine when she turned sixty recently. She felt that she needed some support to take the big step into her third act, which we celebrated with a lot of champagne and your book! I loved Russell Crowe in Beautiful Mind. Excellent movie! I haven’t seen Noah, but should. I am so thrilled that you are making so many movies and television shows. Talent should not be wasted. Thank you Jane for the glowing report of your experience working with Russell. You confirmed for the general public what a large group of us, Russell’s long time fans/friends, already knew about him talent-wise and personality-wise. There is a group of us who have followed Russel in his acting career beginning as far back as his performance with Denzel Washington in Virtuosity so many years ago. We have formed a community of friends, a sisterhood if you will, that still today remain friends and all because of our interest not only in Russell Crowe the actor but in Rusty the man. We have followed him around the U.S., and some other countries, as he has played with his band many years ago and are hoping that one day soon he takes a little time off from work and wants to play some music. Being a fan/follower of yours as well for many, many years I find it pleasing to see that you and Russell have made friends. I have a feeling that once friends with both of you that a person would have a friend for life. I can’t wait to see this film but that’s what I say about ALL of your films and Russell’s films. Thanks for giving us all a glimpse at Russell as a co-worker and also as a person. Take care and if you see him tell Rusty we say HELLO MATE! I’m so glad you enjoyed the city. I hope you’ll visit more often. I’ve lived here all my life although I’ve left and come back a few times over the years, it always seems to pull me back. The winters aren’t too fun (especially not this one just past!) but when spring and then summer returns, it’s that much sweeter. Welcome! The photo of you with Russell Crowe was taken in front of The Mother House of The Sisters of St Francis at Mt Alvernia, Millvale. My aunt who is a nun, lives there. 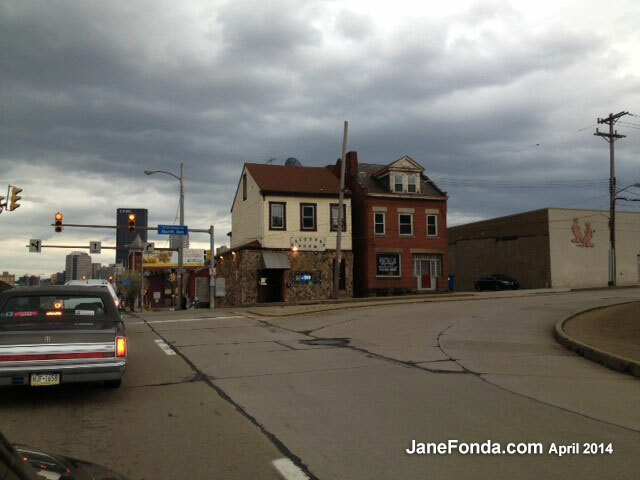 Thank you for the lovely things you said about Pittsburgh and the beautiful photographs. More people need to know about this wonderful city. Laureen, thanks for the info. The institution looked impressive. Also,re Pittsburgh, well-kept secrets are pretty good too, no? Thank you for your kind and gracious words about Pittsburgh Just a correction though – it is Pittsburghers, not Pittsburghians – though that is pretty funny. No worries. I am glad you enjoyed the city and our best kept secret – the food!! If you like good, wholesome food – also try Max’s Allegheny Tavern which as the best German style food around. I have admired your films – especially the comedies from the 60’s – one of my faves is Cat Ballou that you did with Lee Marvin. And no hard feelings from the nineties when you came here with Mr. Turner – we finally got over the curse of the Braves last year! And you are so right about the Pittsburgh Starbucks – anyone can sit in them and just get lost in thought!! Hope that you work in Pittsburgh in the future. Another great bakery – Jean-Marc Chatelier in Etna – he is originally from Brittany and makes the best Breton Cake and pastries – and specialty wedding cakes!! Yummy!! and the museums – take a vacation one day and come back! Thanks for sharing these wonderful images. I am really excited that you are working with Russell Crowe-He is one of my favorites. You have probably seen his earlier films when he was a young actor working in Australia. If you haven’t, check out ROMPERSTOMPER, THE SUM OF US, and PROOF. I saw him in the SUM OF US first, back in the 90s and I KNEW he could be a big star-if promoted the right way. A few years later, he would be! So glad to see YOU working in movies again! Hi Jane! I’m glad you found your way back to Pittsburgh and are enjoying our beautiful city. I’m sure you and the cast are filming day in and day out, working long hard hours on the set. If you have any free time and are looking for a way to relax maybe you should consider a massage from one of the locals. I run the massage department at a local physical therapy clinic. If you’re interested you can visit this link: http://www.aandc.com/services/massage/. Happy shooting! Deanna, alas, I’m back in L.A. Next time! 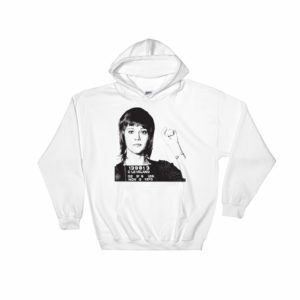 Ms. Fonda, we are Pittsburghers not Pittsburgians. Glad you enjoyed your visit to our beautiful city. 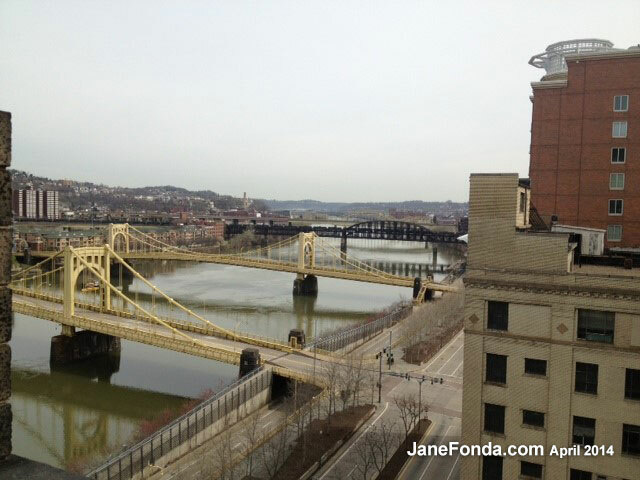 Hi Jane, Thank you for your review of Pittsburgh.. its all you said and so much more!! We call it a secret as many people think it’s different than it really is.. Nice to see Mr Crowe here again also. There have been quite a few movies made in Pittsburgh.. The next time you visit..come early and one of us will show you around! 🙂 lol You are looking great… keep working! 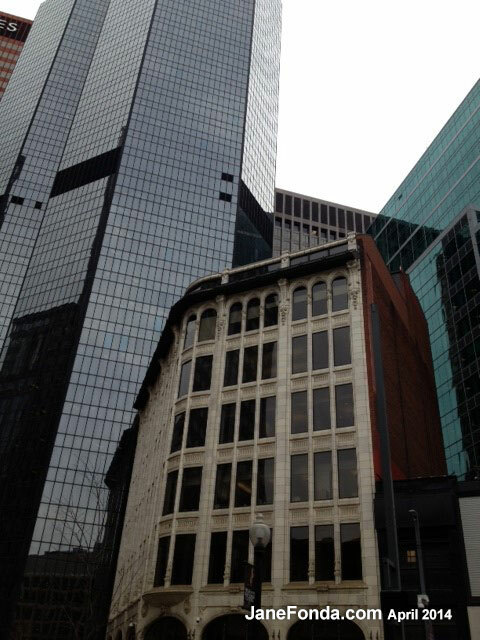 Sorry I missed you during your recent visit to Pittsburgh. The last time we met in person was back in 1967-68 (?) when you spoke here at Duquesne University when I was a student there. Thanks for the positive notes about our great city. It was nice meeting you on set and running lines with you for the second team rehearsals way up on the 29th floor. That was the highlight of my day! Thank you. Side Note: I wasn’t able to tell you, but my grandmother is a true fan of your work. She really wanted me to tell you that, but there was never a good time. If, by chance, there may be an opportunity for her to get a signed photo by you made out to her name (Sharlene). I am only asking of this because I love her dearly. Its unlike me to do something like this, but I know it will make her happy. Again, thanks for all of your hard work and continued success. Thanks, Ben. Where should I send the photo? Thanks for your kind words and good memories of Pittsburgh. We really try our best! I did see you at the Univ of Pittsburgh in 1972-73. Your voice was gone but you somehow managed to give a very heartfelt speech that was personally transformative and stayed with me for a very long time. I was so sorry to learn that you were filming just minutes away from one of Pittsburgh’s best kept secrets while you were at Mt Alvernia in Millvale. I went to the local Croatian Catholic Church and our nuns were Sisters of St. Francis from Mt. Alvernia! My church, St. Nicholas Croatian Catholic Church, houses the internationally recognized murals of Croatian artist, Maxo Vanka. Maxo was commissioned by the pastor to paint murals that would tell the story of the Croatian immigrant experience. Painted between 1937 and 1941, Maxo, a pacifist who left Croatian due to the rise of Fascism, also depicted the horrors of the war in Europe. David Byrne of Talking Heads called Maxo, “the Deigo Rivera of Pittsburgh”. The Murals Society has been working diligently the past 25+ years to raise awareness and to preserve and protect this regional art treasure. Over the past four years, we have been involved in very intensive restoration work with a team of local conservators. I am so sorry to have missed an opportunity to give you a tour of this remarkable site, which sits minutes away from Mt. Alvernia on a quiet side street! I would just ask that you please, please visit our website … if nothing more than to see what you missed but, hopefully, to inspire you to add it to your must see list on your next trip to Pittsburgh. Perhaps you could pass it along to any remaining film crew. We would love to give them a tour; it would be an hour well spent and not regretted. Our website is http://www.vankamurals.com. Thank you, again, for your kind words about Pittsburgh — come again — soon! http://www.vankamurals.com. Please pay a visit. Thanks for this info, Diane. I’m sorry to have missed the Maxo murals—being a major fan of Diego Rivera (he once painted a portrait of my mother and half sister–that’s how Diego made his living in large part–painting wealthy gringos/gringas. But the portrait were never as good as his politcal/social murals because the murals came from his heart. Thank you so much for your wonderful comments about Pittsburgh. We appreciate all your kind remarks and fantastic photos. Looking forward to seeing the film. Wish you could be here May 16, 17 & 18th as the Pittsburgh Women In Film chapter is hosting the Women In Film and Television International Summit at the Westin in Pittsburgh. We have a fantastic lineup. Dear Jane, Wow! I cant believe I have the opportunity to write to you and I see that you read your fan mail/ bloggers comments so I can only hope you get this. First things first, Thank you for being you…a wonderful actress…an eminent figure in the peace movement …and a caring and sharing soul…I saw your article in architectural digest and i must confess I thought it was hysterical (and yet beautiful ) you had a bed in your back patio built like a turkish divan, Probably perfect for those soporific afternoon New Mexican naps. Super happy that you making another film Jane! Love the pictures and Russell. Thanks for sharing and all your great work. Finally reading your book – My Life so Far – enlightening! Two things you mentioned in this post (Pittsburgh and Russell Crowe), as well as yourself, have been subjects of conversations I’ve had with others this past week. Talk about synchronous bliss! A cousin of mine, a deliveryman, often travels from Columbus, Ohio, to Pittsburgh. Last Sunday, during Easter festivities, he and I discussed the latter city. I’ve never been to the ‘Burgh, but I’ve always wanted to go there. Many people, when asked about places to which they’d like to travel, mention Hawaii, Paris, London, etc. But me? It’s Pittsburgh! A number of films I admire have been shot there, and I’d like very much to see some of the locales in real life and time, not just cinematically. Also, there’s the history of the city. I want to stand there, breathe deeply, and take it all in. Last evening at work, a fellow associate and I were discussing film — something that has a way of happening during those times I’m among others (ha ha). My friend had watched Gladiator earlier in the day, and he and I spoke of how it seems to be the film for which Mr. Crowe is most known given the awards he won for his performance. “Well,” I said, “I agree: it’s not a bad performance.” But was it a better performance than those given by Ed Harris in Pollock and Javier Bardem in Before Night Falls that same year? No, and for the record, Mr. Harris would’ve had my vote. Such a devastating, chameleonic performance he gave as Jackson — the same attributes of which can be found, I continued to tell my friend, in a performance Mr. Crowe had given the previous year, in a film called The Insider. His work as Jeffrey Wigand is such a bracing, complex transformation; you look for Mr. Crowe in that film and he’s nowhere to be seen. It remains (to date) his best work, I think. “So he won the award for one film because he should have won the award for another, earlier film?” my friend asked. And let me be frank: if awards consistently celebrated the best, your name would be etched on more than two of those golden statues. Again, not to dismiss others who’ve been awarded for good (if not always exceptional) work, but you’ve given some performances that indicate what acting is at its best. On this I cannot be moved. There are no two ways about it. Also at work the other night, a friend and I (she’s in her sixties) were lamenting the decline of the arts. Not all arts, understand, as there’s still some wonderful work being created in music, film, television, etc. It’s just that you have to be more diligent in seeking out said work in each medium. As we spoke, we mentioned how so much of what constitutes “popular” music pales considerably to the music of the sixties and seventies. Where are this generation’s Beatles and Rolling Stones? Joni Mitchell, anyone? And television? Sure, there’s great stuff if you have cable. But so much of television today is saturated with “reality TV” (an oxymoron if ever there was one!). Where are this generation’s equivalents to, say, Norman Lear and Bud Yorkin? Rod Serling (he’s more fifties and sixties, I know, but his name must be mentioned when speaking of the greats)? “Oh,” I said, “Ms. 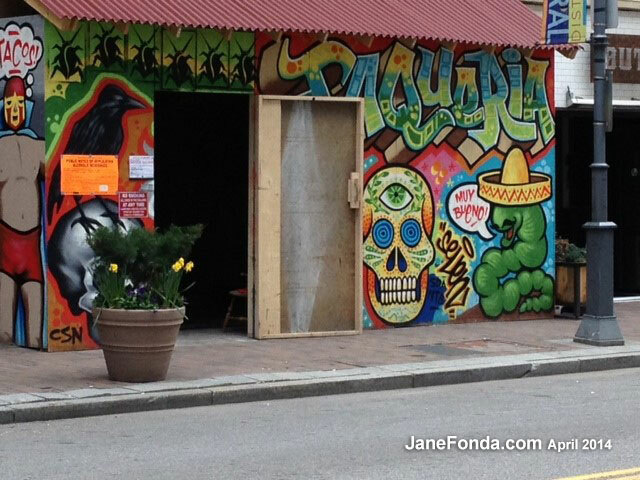 Fonda’s still around. And thank goodness!” Then I told her of the work you’ve done with youth, your wonderful writing, and the passion you apply to making this planet a better a place, as well as those who populate. Which isn’t to say you haven’t done great work lately, both in film and television. What I meant was more an expectation of a joy returned — one whose fulfillment will result in seeing you carry a film. Another great performance to add to a roster that includes Gloria, Bree, Sally, Kimberly, Judy, Chelsea, Gertie, Viveca/Alex, Iris… Well, the list goes on and on. And hopefully will go even longer, with names yet to be known added to it. It’s bound to happen, given that you are a person who stays interested (an essential element in life) and who chooses work that doesn’t merely entertain, but that also reminds us of the power of empathy (another essential element in life). As for “Fathers & Daughters,” I doubt mentioning my excitement is necessary. Is it a fictionalized story? I know of some (sadly, too many) wonderful writers and winners of the Pulitzer Prize who suffered from depression. People like Lewis B. Puller, Jr. (Fortunate Son — a biography I recommend without hesitation) and J. Anthony Lukas (Common Ground — a fascinating work of non-fiction). Being a writer and chronic biblio- and cinephile, any information you could give with regard to the film and genesis of its story would be greatly appreciated. JOHN, THANK YOU FOR ALL THIS AND FOR YOUR GENEROUS WORDS ABOUT MY ACTING. BTW, DIDN’T RUSSELL WIN AN OSCAR FOR “A BEAUTIFUL MIND”? 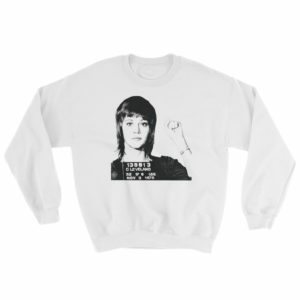 Ms. Fonda, you’re very welcome. Generous words, heartfelt and true, should be offered to those who have made a difference in others’ lives through their vocation and passion. Certainly, this applies to you! How could it not? Understand, my intention isn’t to be sycophantic or grandiose (as a writer and a fellow artist, I can sometimes be a tough customer, ha ha), but your work, both on-screen and off, has served to make the world a better place. It really IS true. It isn’t just that we have the intense joy and pleasure of watching an artist hone her craft, but do it in service to stories that offer us a chance to consider the world in which we live, and, by doing that, become smarter, informed, and better human beings. Seriously, in addition to your work as an actor, you and Mr. Gilbert produced some stunning films that, while they were busy entertaining us, also managed to inform us about issues that matter. It’s one of the reasons why, when I sit down to write, I set for myself the goal of telling stories that people will not only enjoy, but that will also give them an opportunity to have their minds and hearts engaged and challenged. It is this to which artists should aspire. It’s not enough simply to see something; we must be persistently interested and look beneath the surface, sift through what lies there, and bring it to light. Just think how many times you have done that! And how you are still doing it! Not just as an actor now, but as a writer, too. Regarding your question about Russell Crowe: he didn’t win an Oscar for A Beautiful Mind. That year, Denzel Washington won an Oscar for Training Day (his second award, but his first in the leading actor category). A Beautiful Mind did win some awards, though: picture, director, supporting actress, adapted screenplay. The film is a sore spot for me, as it disservices John and Alicia Nash, as well as Sylvia Nasar’s splendid biography (didn’t I say I could be a tough customer?). The problems lie in the screenplay, which (not to be rude) isn’t very well-written. In fact, it is depends too heavily on the saccharine and overly melodramatic. When I read it, I shook my head in disbelief. Such a wealth of material, and THIS was what was done with it? Also, one of the Nashes’ children also suffered from schizophrenia (of the religious persecution variety). In the film, no mention is made of this. (Alas, people who see the film but do not read the biography might well not be aware of the consequences heredity sometimes plays with regard to this illness.) Instead, what you get is a couple literally walking off into the sunset! Perhaps if, during the film’s release, the filmmakers hadn’t given a plethora of interviews in which they spoke of how hard they worked to make an “authentic” and “honest” film about their subject, I wouldn’t have been as disgusted as I was. For unlike Alan Parker, who said of the criticism aimed at Mississippi Burning, that he was making a motion picture, not a documentary, the makers of A Beautiful Mind seemed to want to have their cake and eat it, too. When, as artists, you’re dealing with real-life human beings, and you speak of such things as “authenticity” and “verisimilitude,” then you’d damned well better respect them. An exemplary example of a film that does it correctly and honestly is Soldier’s Girl. Clearly, Frank Pierson and Ron Nyswaner did their homework. What’s more, their dedication to telling the truth about the tragic love story of Barry Winchell and Calpernia Addams permeated the rest of the film, most notably in its excellent performances. Never does the film pander; nor does it attempt to manipulate your emotions; rather, it earns them. Those involved weren’t afraid to ask the tough questions. Nor were they afraid to share what discoveries they made, no matter how painful the denouement. Instead of machinations and the crude trotting out of stereotypical bunk, we were offered instead a story that celebrated the memories of real, flesh-and-blood and -soul human beings who lived it. When it comes to depicting the lives of real people on film, THAT is what is achieved when it’s done the right (the best) way. I own a copy of Soldier’s Girl, and I’ll confess that sometimes I have to stop watching before Barry’s final scene plays. Troy had me so invested in his character and the story that watching the scene is a physically harrowing experience, which is as it should be. I remembering hearing somewhere that Ms. Addams has only seen the complete film once, because watching Barry’s final scene proves to be too painful for her. Troy is also wonderful in Lake City. He and Ms. Spacek created a beautiful bond in that film. Drea DeMatteo and Dave Matthews (yes! THAT Dave Matthews) were also very good. John, imagine how I felt as his mother. I had to cover my eyes and close my eyes. Calpernia has become a personal friend. Troy will soon start an HBO series starring Dwayne “The Rock,” about football: “The Ballers.” Excited for him. Ok…you made me so curious I had to look it up! According to imdb, he was nominated in 2000 for The Insider, 2001 for Gladiator, and 2002 for A Beautiful Mind. He won for Gladiator. However, it also said he won the Golden Globe for A Beautiful Mind. I was remembering the same thing, Jane. I thought he won the Oscar for A Beautiful Mind as well but I guess I was thinking of the Golden Globe. This is off topic of your blog. It appears you can take Tulea with you wherever you go without difficulty. Did she have special training as a puppy? She is such a beautiful, well behaved dog. Joya, She is a service dog. I hardly needed to train her. She came to me at 2 months just about perfect all on her own. She follows me everywhere and when she can’t be with me she’s with my assistant who’s like a step-mom and whom she loves so I don’t have to worry. But when she’s not with me I feel something missing–it’s visceral. I keep looking for her. Fortunately that doesn’t happen often. 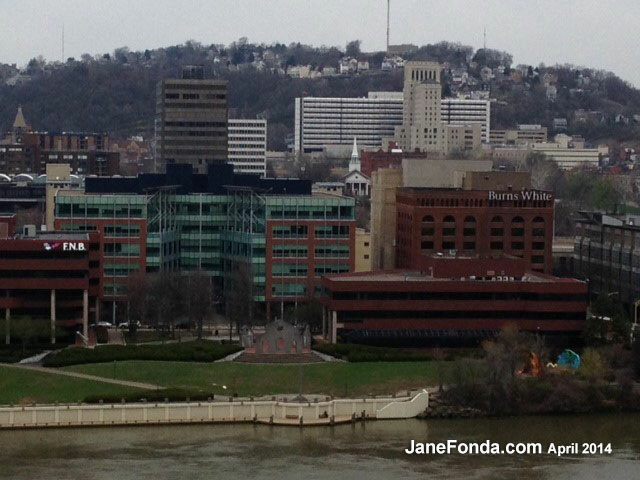 But she didn’t come to Pittsburgh with me–too quick a turnaround and no one to watch after her while I was filming. She is the cutest little dog! I love the pictures of her you post on this website. Of course, I’m partial to dogs…I have two of my own and couldn’t love them any more if they were actual human children. Of course, they think they’re human…but that’s a whole other story! I actually got to see the both of you in person once. Several years ago…when your first book came out…you came through Lexington, KY for a book signing at the Kentucky Book Fair. You spoke at a luncheon with Sue Grafton and my friend and I attended that luncheon and then later stood in line for you to sign my book. You were even gracious enough to let me take a picture with you. At the luncheon there was a Q&A session and I got in this long line at a microphone to ask you a question. When it was my turn I asked you if it was true that Dolly Parton was writing a Broadway musical version of 9 to 5. At the time, you said you had no idea but you had heard that as you had recently seen Dolly when you recorded the commentary for the 25th anniversary DVD (so this must have been circa 2005). I have that DVD by the way and I love watching it and listening to you all chat about the making of the film. Oh, and this past October I played Violet in a local production of Dolly’s musical (I’ve posted a picture of our production in the Film, Television and Theatre page here). I had so much fun doing that show! Anyway, back to Tulea, you are so lucky you can travel with her. My dogs are too big to travel with us unless we drive everywhere and sometimes that’s just not an option. What kind of breed is she? Tulea is a coton de Tulear (pronounced tulea–no ‘r’ because in French you don’t pronounce an ‘r’ unless there’s an ‘e’ after it.) The breed originated in Madagscar, formerly a French colony. Came from the Madagascar town of Tulear…so she’s a cotton from Tulear. TMF perhaps. 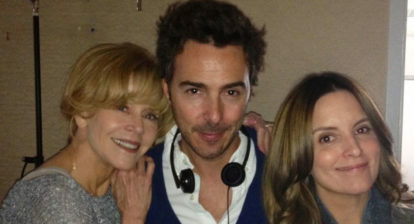 Dear Jane, I have to agree with Tripp, you are truly a triple A´s. Sadly, the acronym AAA brings very scary and bad memories of my teen years in Argentina in the ´70s. I was so glad you really liked my country!!!. I hope you understand that I had to find something to ask you, in order to keep this short conversation forever in my memory. 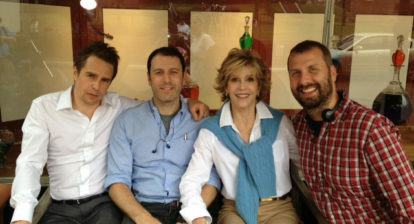 You made me laugh with the spontaneity of your body language telling the helicopter crew to leave us alone at the set. It worked!! Pittsburgh has been my home for the last 25 years, but the beautiful Buenos Aires is always in my heart. I hope you have the chance to go back. It was a treat meeting you. I am so glad you enjoyed your time in Pittsburgh. 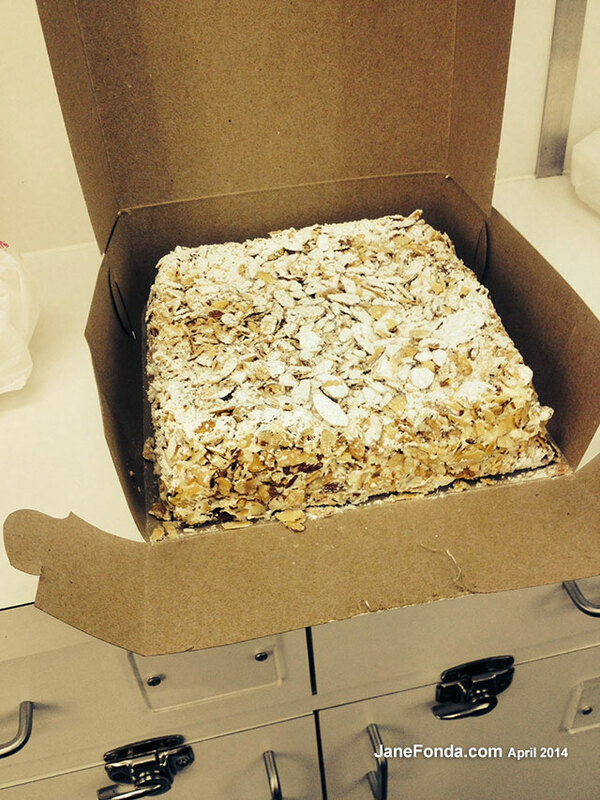 It is truly a hidden gem and we love when out of town people share their great experiences! Please come back when you have more time to spend exploring all great history, architecture, food and of course our friendly people. I enjoy your films and am looking forward to Fathers and Daughters. Pittsburgh has become the second New York for films and we are so proud of that. 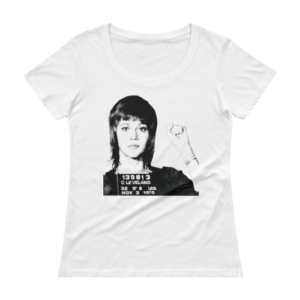 I just happened upon your site, Ms. Fonda. Impressive to me due to your informal writing style. Many enjoy reading about places others visit, so thank you for writing of your travels. What people do from day to day can be insightful at the most opportune moments. I appreciate that you are open and share these tidbits from your life. Hearing another’s perspective can help keep people curious. Thank you for sharing. Sorry I didn’t see you filming in my home town. I’m a big admirer of your work. I saw you when you were in Pittsburgh during the 1970’s. I also saw you during the “9 to 5” era when you spoke in Pittsburgh about clerical workers. I went to NY to see you in the reading of “Necessary Targets” and in “33 Variations”. Memorable performances. And you signed my copy of your memoir! Looking forward to your upcoming films! Hi Jane – i just wanted to say that your doc “The Dead Mother’s Club” was just overwhelming to me. Although I am not in this club the feelings that were expressed by all were very touching. But, especially yours, it was brave and honest and evoked feelings in me that I havve worked hard on too all my life. I think you are great, but then again I always have. Glad you are happy – it shows! Hello Jane. I agree with you completely concerning Jennifer Lawrence. There is really something there. She reminds me of great actresses and comediennes of the past and in particular, Carole Lombard, but @ the same time she is her own modern and unique self. Her movements, her timing and her character choices are fluid and unexpected and perfectly right. She is a joy and I look forward to her future as a great actress. Speaking of which, I have always been struck by certain women’s performances that have changed my concept of what acting is, how it can effect the viewer and how it pushes acting in general to another level. There have been a few actresses in the history of film that have done this for me. Falconetti in The Passion of Joan of Arc, Agnes Moorehead in The Magnificent Ambersons, Vivien Leigh in Streetcar, Angela Lansbury in The Manchurian Candidate and most recently, Cate Blanchette in Blue Jasmine but to me the greatest performance by an actress in film was your Bree Daniels in Klute. I had never seen an actor so completely be the character they were portraying and @ the same time, not be lost in the character but instead be completely in control. It astonishes me every time I see it and I still drag people who have not yet seen it, to my home to screen it for them. I have just had my 60th birthday on July 3. I have seen many many movies in my lifetime. My mother taught me to appreciate the art of film @ a very early age and what I say is the truth. I have always wanted to thank you for the gift of your acting and in particular, Klute and so, thank you. And btw, I was there @ Pitt University @ your war protest way back in the 70s while I was attending Carnegie-Mellon U!